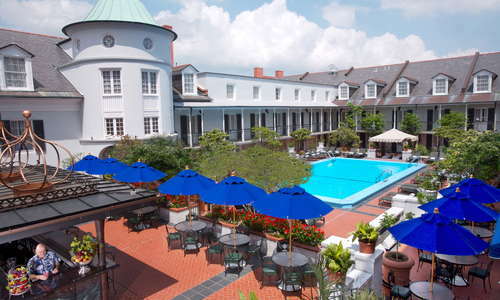 There’s a little something for everyone at this sprawling, resort-like hotel overlooking Bourbon Street. 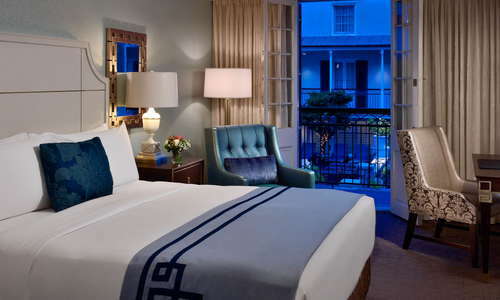 Refined meeting rooms, elegant yet rowdy Bourbon Street-facing balcony suites, a sunny pool deck, and an ultra-fine dining restaurant are just some of the things that attract families, businesspeople, and bachelorettes alike to this comfortable and accommodating hotel right in the middle of the French Quarter. Standard rooms are cozy, with very comfortable pillow-topped mattresses and modern furniture and amenities. 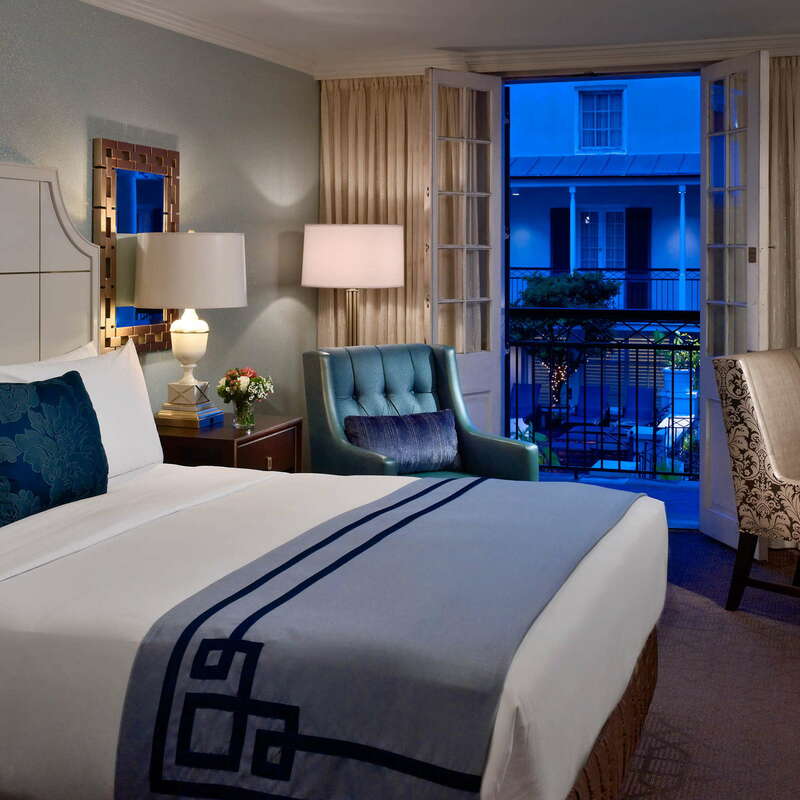 Some rooms have balconies, and all rooms include views of the French Quarter or look over the large pooldeck and courtyard. 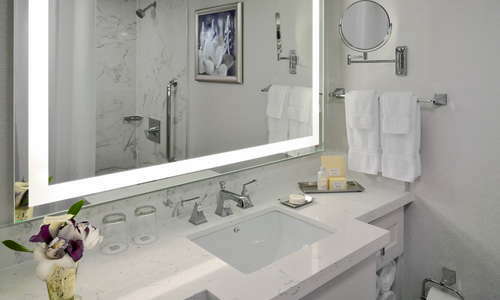 Rooms on the 6th and 7th floor are “R Club Level,” include a personal concierge and access to the 7th floor Club Lounge (and terrace) for complimentary cocktails and appetizers in the evenings, and complimentary hot breakfast. These floors are also much quieter since they face away from Bourbon Street. If you want a quieter room, but don’t want to pay extra for the club level, request a courtyard-facing room. 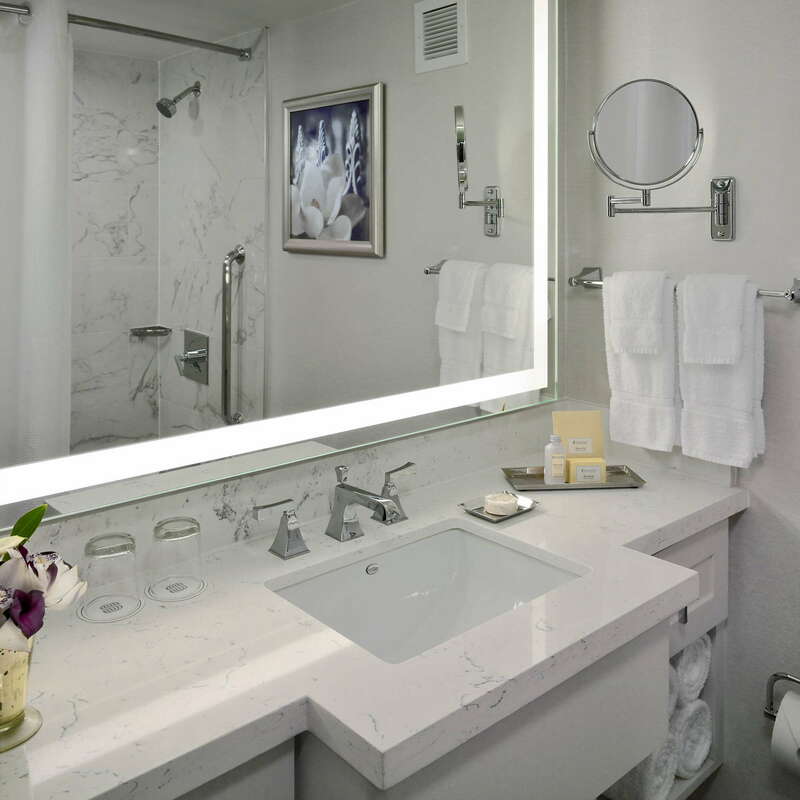 Bright and modern with marble surfaces, L’occitane products, and spacious showers. 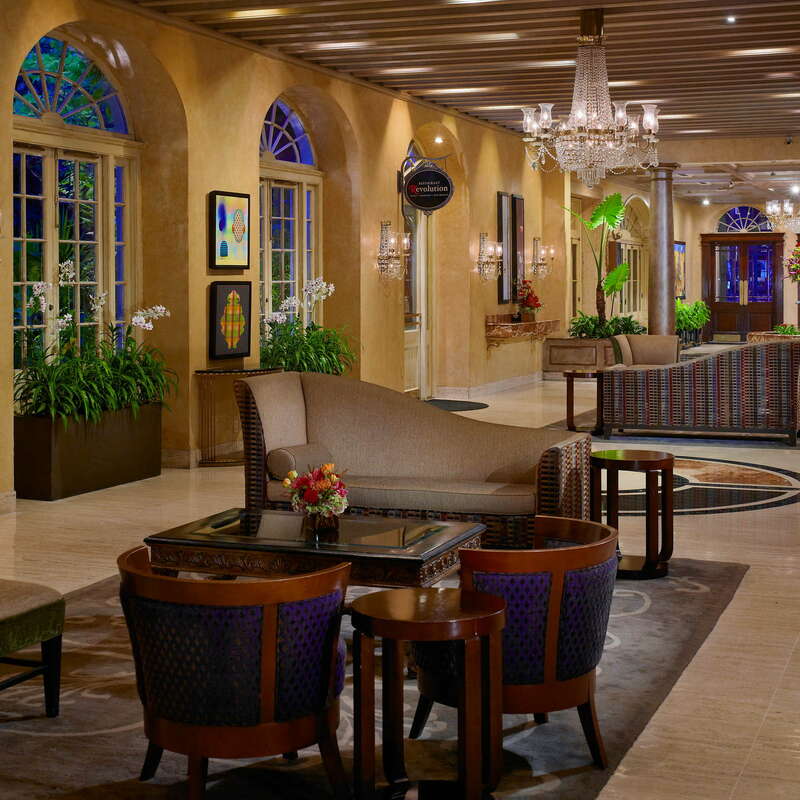 The lobby is spacious with plenty of seating and french doors leading out into a cobblestone, plant-covered courtyard. There is a PJ’s coffee shop off of the lobby. The hotel's upper floors frame the large, sunny pool deck on each side, giving the pool area a relaxed, private feeling. The saltwater pool is big compared to many hotels, there is a seasonal, covered bar with stools, pool towels for guests' use, and plenty of lounge chairs. 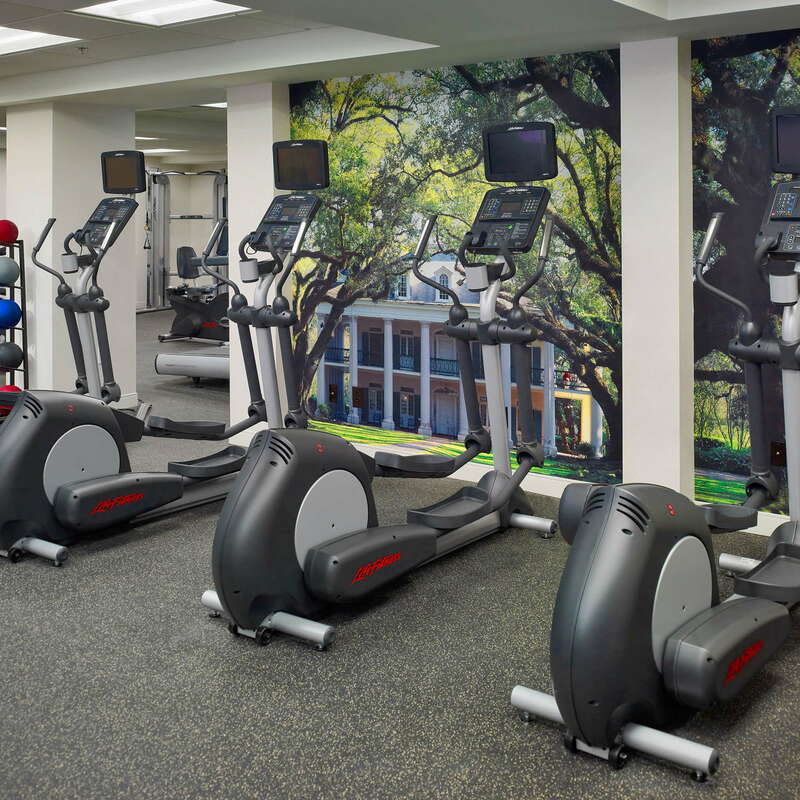 The fitness center below the lobby is large enough for a real beignet-burning workout, with new cardio and weight training machines, free weights, and a stretching area. 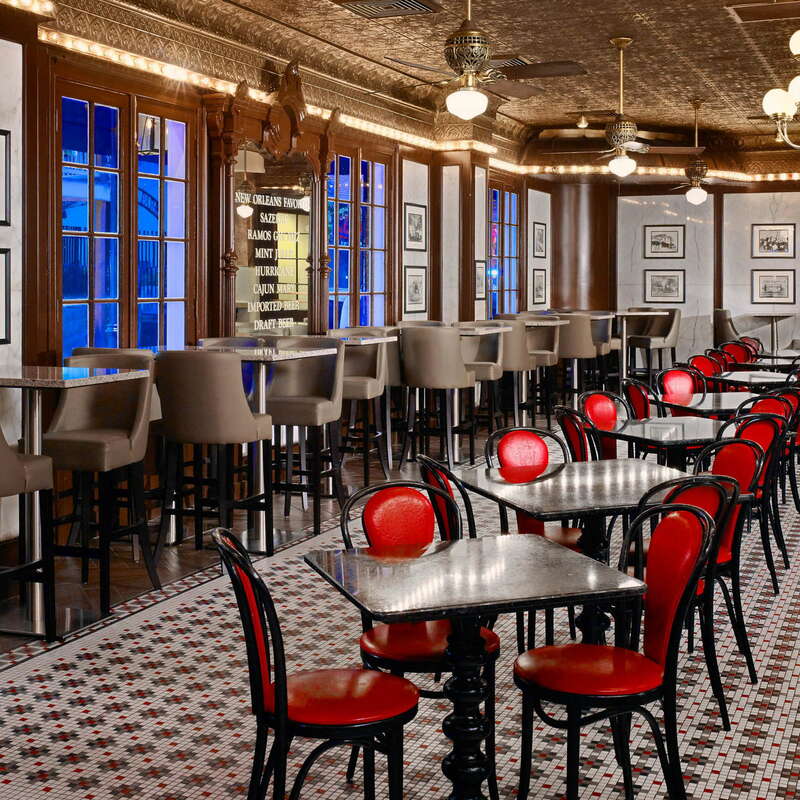 The Desire Oyster Bar is one of the only in the city with its own authentic char grill, serving up both char grilled and raw gulf oysters, with a $1 oyster happy hour and a fair amount of other tasty appetizers and larger dishes. Desire serves breakfast, lunch, and dinner. 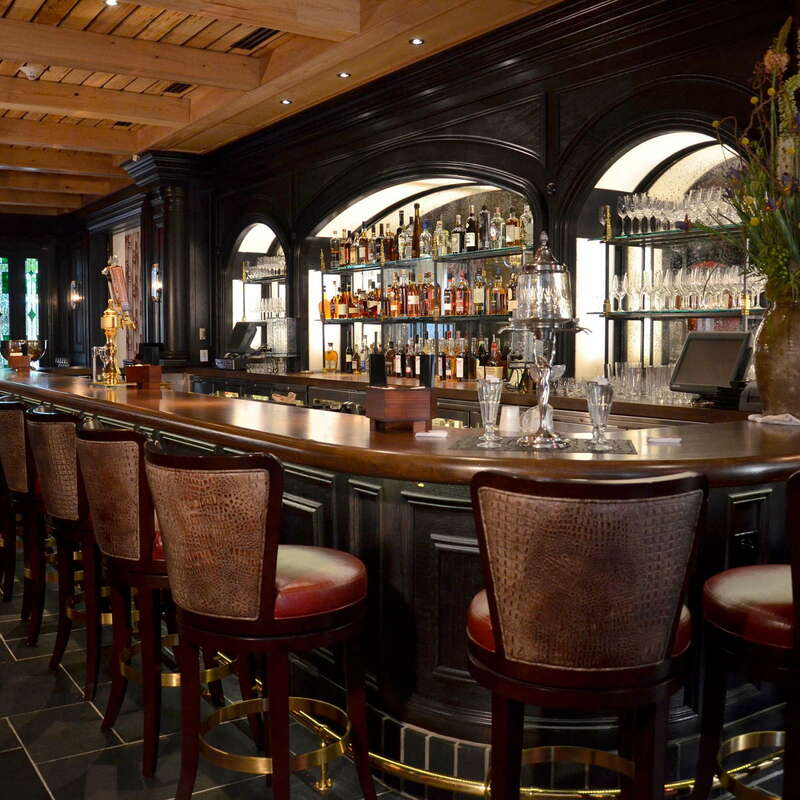 Accessed through the courtyard, Restaurant R’evolution is a gorgeous fine-dining restaurant with some creole and some modern touches, a fantastic wine list, and impeccable style and service. Room service is also available from the hotel 24 hours. YOU SHOULD KNOW Restaurant R’evolution is a formal dining experience. Make a reservation ahead of time and, while there is no stated dress code, skip the T-shirt and flip flops if you want to fit in. Not the place for small children. 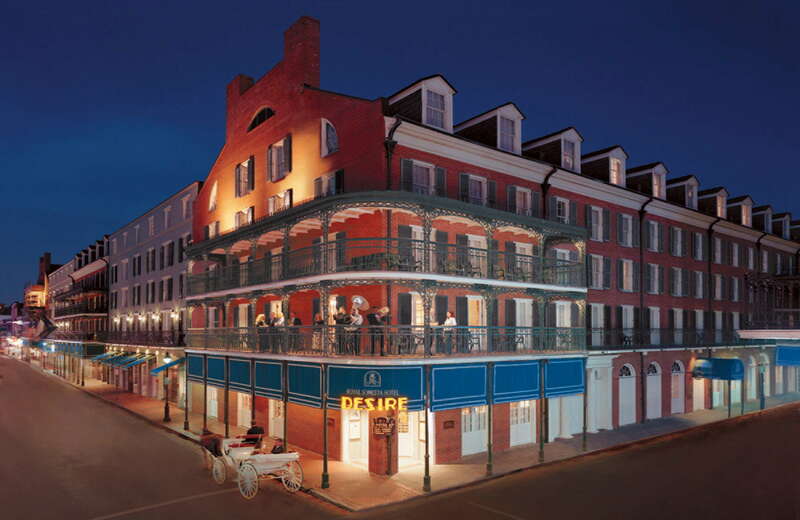 To the right of the hotel entrance you’ll find Le Booze, a casual whiskey bar where you can people-watch the colorful Bourbon Street passers by. 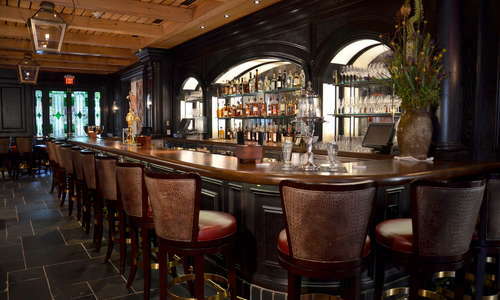 Bar R’evolution offers up the old school class of the full restaurant with an emphasis on seasonal craft cocktails, and the Jazz Playhouse has an excellent full bar as well as live local music every night. 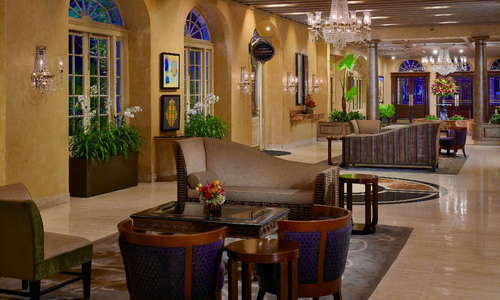 There’s a free shuttle to the hotel from the airport, and the Sonesta also provides valet and has its own covered garage. The Canal Street, St. Charles, and St. Claude streetcars are all a close walk away. 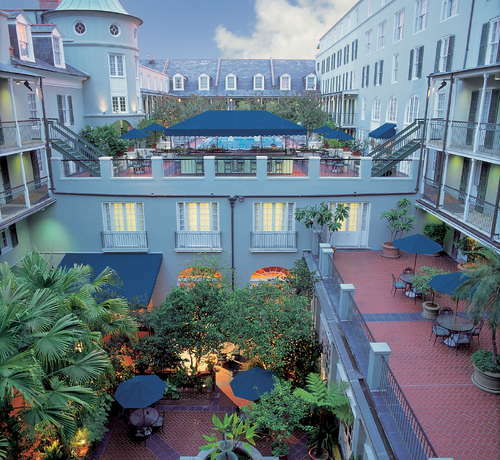 You’ll want to explore the French Quarter on foot from the hotel. Though certainly not a French Quarter secret, Acme Oyster House (2-minute walk) is worth withstanding the crowds for its fried seafood classics. 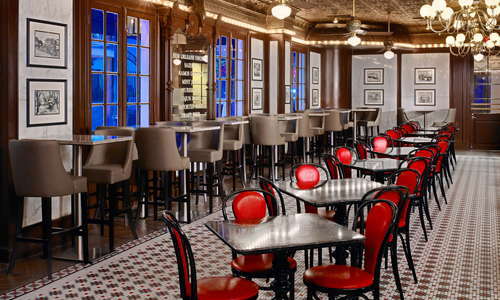 Starting as a small kitchen inside the Erin Rose bar, Killer Po Boys (2-minute walk) has expanded to its own spot on Dauphine St. and continues to please crowds with its gourmet-hipster renditions of Nola classics. Erin Rose (2-minute walk) is one of the finest bars in the quarter for a good time and a taste of their famous frozen Irish Coffees. The Old Absinthe House (1-minute walk) is another favorite bar for experiencing that unique French Quarter mix of fun, history, and good booze (in this case, various types of absinthe prepared in the traditional way). 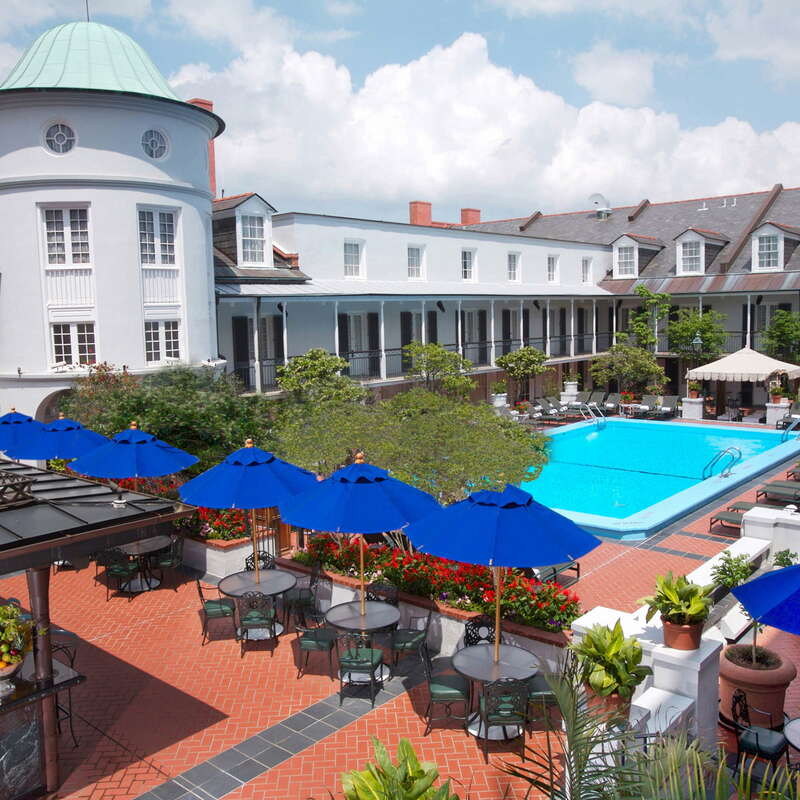 The Royal Sonesta will appeal to many looking to do as much in New Orleans as possible in a short period of time, because it’s very comfortable and right smack dab in the middle of things. 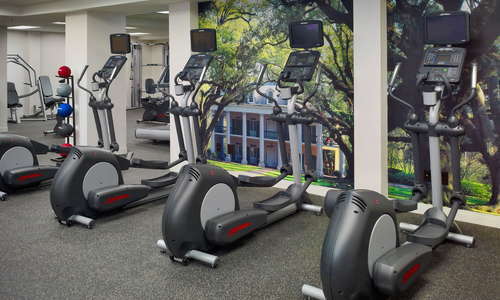 It’s great for a business tripper who wants to have time to crawl bourbon street after meetings, or tour the french quarter on their off hour. 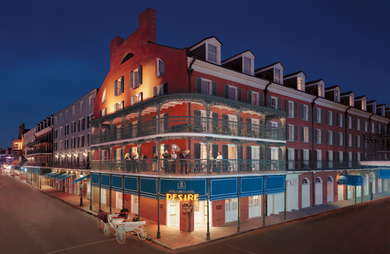 The Bourbon Balcony rooms and suites let groups or parties soak in some french quarter celebration at an elevated level. And the hotel could also appeal to families: the pool is tolerant of children, and parents will be grateful that their naptime spot and tourist spots aren’t far away from each other. To top it all off, Restaurant Revolution is among the best fine dining experiences in the city, hotel or otherwise.